Better Than Never: vote for chrissy! Despite being on all manner of social networks, I'm actually not that great at promoting myself. 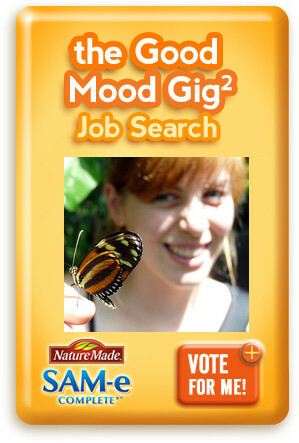 That said, I've entered a contest and I'd love for you to vote for me! The winner of the contest will become the official Good Mood Blogger for SAM-e, a company that makes over-the-counter supplements which help to restore a healthy mood by promoting a balance of brain cell functions. As their blogger, I would be responsible for writing the Good Mood Blog on their website - that is, posting five times each week for six months, about my good mood and the things that bring a smile to my face. Of course, a job wouldn’t be a job unless you get paid to do it. If you’re our new Good Mood Blogger, you’ll actually be working as an independent contractor with Ignite Social Media, writing for Nature Made SAM-e Complete®. For your efforts, you’ll be compensated with: $5,000 a month for six months = $30,000! and a brand new laptop so you can work from virtually anywhere. Naturally, I think I'm perfect for the job. I'm optimistic, upbeat and tend to look on the bright side of every situation. I love writing and blogging, I love sharing positive things with others, and let's be honest - it would be awesome to pay off a huge chunk of my student loans in just six months! If you agree with me, please take two seconds of your day to vote. You can vote every day until November 10th, when this portion of the contest ends. If I make it into the top 20, then I can move on to the final round. Very exciting and within reach - if you'll vote for me! It seriously takes two seconds. No sign-ups, no log-ins, no registration. Just follow the link and click vote! I'm currently at 151 - it would be awesome to hit 200 by the end of the day!